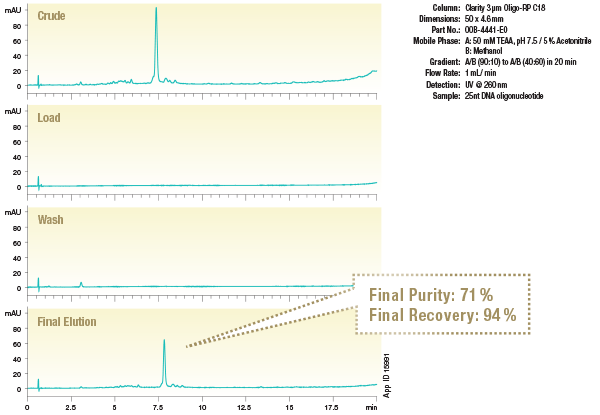 The Clarity BioSolutions sample preparation portfolio is composed of unique solid phase extraction chemistries packed in 96-well plate and cartridge formats designed to efficiently and effectively purify oligonucleotides. Developed to be a versatile, gentle, and extremely effective trityl-on purification process, Clarity QSP 96-well plates and cartridges deliver near impurity-free, concentrated full-length sequences. Clarity OTX is a simple, rapid, and reproducible solution that efficiently extracts oligos from biological matrices and can be easily automated. Using Clarity QSP cartridges, we were able to substantially minimize if not eliminate depurination from occurring during purification. Clarity QSP cartridges provide ease and efficacy not typically found in competing trityl-on purification platforms, such as the *TOP™ products. Clarity RP-Desalting™ tubes utilize reversed phase, in lieu of size exclusion, to eliminate salt and reagent from trityl-off synthetic oligo mixtures in order to capitalize on the speed and loading capacity benefits. A quencher-labeled sample of DNA (25nt) with the sequence FAMTTGACTTAGACTTAGA-CTTAGTTT was desalted using Clarity RP-Desalting tubes in the 200 mg/3 mL format. Collection fractions were then analyzed for purity and recovery using the above protocol.